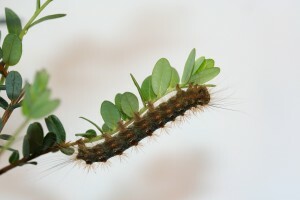 Gypsy moth is an occasional pest of cranberries. Gypsy moth caterpillars will readily eat the plants in outbreak years, when they are abundant in the NJ Pinelands, like in 2007. They prefer to feed on oaks, but when they encounter cranberry plants, their presence can have a devastating effect. Fortunately, since 2007, the caterpillars have rarely been seen in the NJ Pinelands. However, this doesn’t mean we shouldn’t be prepared for their eventual return. Also, studying cranberry resistance against gypsy moth will teach us about the resistance of the plants against other important pests as well. At the Cranberry & Blueberry Research Center, studies led by Dr. Elvira de Lange (post-doc) are currently testing the insect resistance of seven varieties of cranberry, including the widely used variety Stevens and newer varieties such as Crimson Queen and Demoranville. Elvira started off wrapping the different plants in white polyester sleeves and adding a number of gypsy moth larvae that just hatched from the egg. A week later, she retrieved the larvae from the plants and weighted them, to evaluate whether or not they grew well on certain plants. Also, she scored the damage the gypsy moth evoked, as a measure for plant resistance. She is still evaluating the data, in order to know if certain cranberry varieties are more resistant than others. But what does plant resistance consist of? Elvira took a number of leaves from the gypsy moth-infested plants for analysis of toxins. Also, she is studying the volatiles or aromas that gypsy moth-infested plants emit. These aromas may have a detrimental effect and guide herbivorous insects to the plants. However, the aromas may also have beneficial effects and attract the natural enemies of herbivores (predators and parasitoids) or repel herbivorous insects. Elvira will identify the aromas each cranberry variety emits, and also study the effects that these aromas have on different insects. Altogether, it is important know which cranberry varieties are resistant against gypsy moth and other caterpillar pests, and what factors account for this resistance. This information may help us develop new varieties with improved resistance qualities.